Executive Chef Steven Menter gives Baja cool to branzino at Stephen Starr's El Vez restaurant in Fort Lauderdale. Menter helped Starr start the New York version of El Vez in 2014. 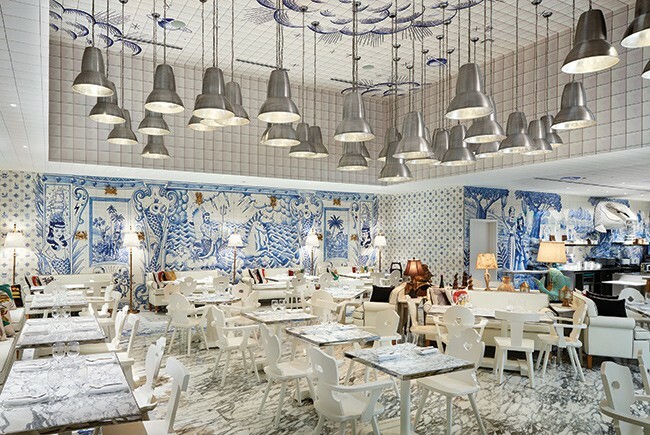 Jose Andres' Bazaar Mar at the SLS hotel in South Beach features everything from "sea snacks" to an extensive raw bar. A restaurateur with boundless energy and a gift for theater, Philadelphian Stephen Starr is outshining many Manhattanites in South Florida. He lit up Philly with 21 restaurants, from pan-Asian to farm-to-table, and tackled New York, Washington, Atlantic City, Paris and Florida. That’s won him Restaurateur of the Year gold from James Beard, Zagat and Bon Appetit. His Florida menu now includes four hot restaurants in South Florida. His first hit was Steak 954 at the W Hotel in Fort Lauderdale. It was a new generation steakhouse with dry-aged, 2-pound porterhouse, butter-poached lobster, diver scallops in romesco and a grand Key lime-baked Alaska for after. Starr moved south to chic Bal Harbour with two helpings of edible elegance to match Balenciaga and Saint Laurent, Makoto and Le Zoo. He installed sushi master Makoto with his contemporary Japanese, from robata-grilled tiger prawns to watermelon ceviche of marinated seafood on a bed of ice spiked with serrano and lime. In 2015, Starr added Le Zoo, a Mediterranean mix of top-dollar seafood plateaus, tartares and carpaccios, pasta and French classics, such as moules-frites and a strong tour of French cheeses and wines. 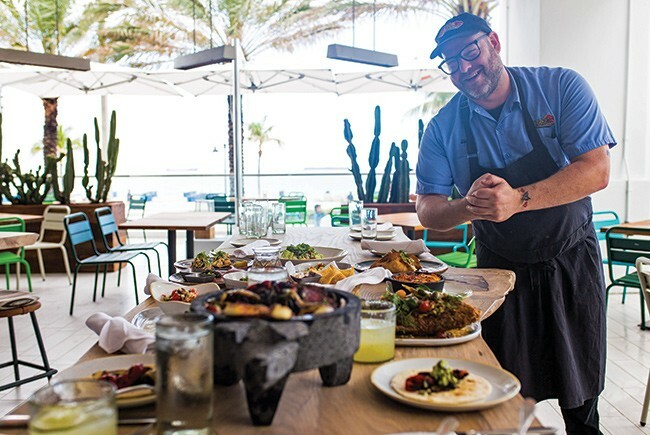 Two years ago, Starr added El Vez, a version of his Philadelphia Mexican concept to the beach side at the W. It serves huevos rancheros, whole fried yellowtail and tacos al carbon for two. Starr splashed into Miami Beach with Upland in the trendy South of Fifth neighborhood. It mixed big-city cool and rustic roots, which had made its way from the chef’s hometown in California to big success in New York City. Chef Justin Smillie runs a mean oven, charring, searing and roasting fish, short-ribs, beets and more on the wood fire and its coals. Purist pastas and vegetables, too. The freshest Italian breeze to blow into Naples came from … Minneapolis. The Sicilian-rooted D’Amico family had opened Cucina, the Twin Cities’ breakthrough contemporary restaurant, in 1987, then Richard and Larry D’Amico followed the trail of Twins fans and winter golfers to Southwest Florida. In 1998, they opened Campiello with a wow. They've remained gourmet leaders in both cities ever since. Up north, they have a Campiello, Lurcat, Market House, society catering, art museum bistros and more than a dozen restaurants started by Cucina’s kitchen alumni. In Florida, the family’s imprint is similarly large: Campiello gave Naples its first sampling of vigorously authentic regional Italian and inventive dishes like ziti with swordfish and bottarga or Campari-cured salmon. Plus, there’s house-made pasta (minus gluten, too), a jubilant bar scene and stunner desserts. Campiello alum Vincenzo Betulia has gone on to create Tulia and his own next generation of osteria Italian and bistro French. The Continental steakhouse is the D’Amicos’ latest (down the street from Campiello) and one of Florida’s hottest, serving an exceptionally broad selection of luxury prime steaks from Iowa, lean Piedmontese and wagyu from Australia, America and the original from Kobe, Japan, at A5 grade ($150 for six ounces), and an equally wide fish catch. D’Amico & Sons is just as fresh and closer to plebeian prices. The cantina has wood-fired pizza and old-school meatballs, plus novello tricks like zucchini vermicelli and bottomless house wine for $9.95, as big a hit in Naples as in Minnesota. Unlike in Minnesota, all three have abundant al fresco seating. America’s top Spanish chef, José Andrés, was born in Asturias, Spain, and trained at El Bulli, but his U.S. home is Washington, D.C. He started at the pioneering tapas bar Jaleo in 1993 and now has nine restaurants there and a dozen others from Las Vegas and Mexico City to Florida. He arrived in Miami with Bazaar at the SLS hotel on South Beach, a stunning collaboration with designer Philippe Starck, where the menu starts with dramatic tapas, such as ceviche in coconut shells, tacos of Iberico ham and caviar and croquettes and winds up at Catalan paella with squid ink. That begat Bazaar Mar at a new SLS in Brickell, long on crudos of abalone or geoduck and uni plus seaweed funnel cakes, fried squid po’ boys, grilled cobia and branzino baked in salt. Andrés also presides over the sushi and snacks at Hyde Beach, the waterfront night spot at SLS, and has an Orlando Jaleo opening this spring in Disney Springs. Whatever their origins, I’m glad Florida is their destination.